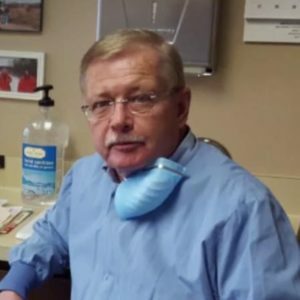 “On Sunday, July 30 ,2017, I received a call around 7 a.m. from the property manager of the office park where my Brookfield dental practice was located. She said there had been a fire in my building and I should come over. As I drove over, I thought I’ll probably need a fan and vacuum cleaner. “Upon arrival, I found the smoldering wreckage of what had been our office building…A few minutes later one of my colleagues in the neighboring building tapped me on the shoulder and said another one of our dental neighbors was retiring and wanted someone to take over his lease…by that night, I had arranged to immediately use the retiring dentist’s office three days a week. “Besides this good fortune, an assistant from the other dental office in my building said, ‘Dr. Saur, your record file cabinets survived!’ The floor of my second floor office had collapsed, except for a few square feet where my patient records were kept. “On Monday morning in front of a still smoldering building, I met with the claims adjuster from West Bend insurance. He soon put my mind at ease by explaining that thanks to WDA’s Professional Insurance Programs, my loss would be covered 100 percent…With a little help from my friends, West Bend , the WDA and a lot of divine intervention, everything was going to be OK. With all that support and that of my staff, family and patients, we survived! “Working just three versus five days a week, our production decreased. West Bend stepped up and compensated the practice for lost income until we were able to resume working full time…Throughout our rebuilding, Linda Welker from PIP called me every 3 – 4 weeks to make sure everything was going well and coordinated with West Bend insurance and the claims adjuster was always just a phone call away for questions or assistance. Error: Error validating access token: Session has expired on Monday, 15-Apr-19 09:32:54 PDT. The current time is Thursday, 18-Apr-19 13:46:04 PDT.